Paneer masala with cashew nuts recipe - This paneer masala with cashew nuts, milk, onion and tomato based gravy is a creamy and rich dish for Indian flat bread naan, kulcha, roti, lacha paratha etc.These days, paneer dishes have become sumptuous side dish for flat breads and the dishes attract vegetarians a lot. The paneer dishes are much in demand here, be it paneer tikka, kadai paneer, paneer peas korma or simple paneer capsicum stir fry. I make it a point to make fresh paneer at home, using fat free milk. 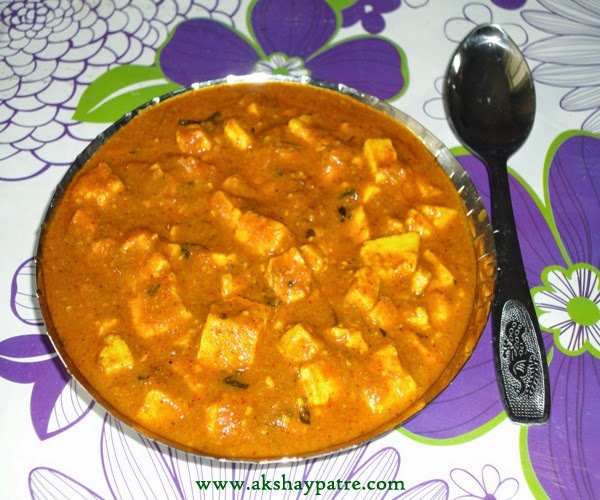 Home made paneer has freshness and special creamy flavour with soft and smooth texture. This paneer masala is so tempting and spreads the aroma, to tickle the taste buds. Put the cashew nuts in the mixer and grind it to a smooth thick paste, adding required water. Transfer the paste to a bowl and set aside. Cut the onion and tomatoes separately. Put the chopped onion in the mixer, and grind it to a smooth paste, without using any water. Transfer it to a bowl. In the same mixer, put chopped tomatoes and grind it to a smooth paste, without adding any water. Transfer the paste to a bowl. Cut the paneer into equal sized small cubes, put them in hot water and set aside. In a deep pan, heat 2 -3 tbsp oil and add the cumin seeds, cloves, cinnamon and green cardamom to it. Fry until spices crackle and spread aroma. Then add onion paste and fry until it turns light brown. Add 2 tbsp ginger-garlic-chilli paste and saute until raw smell disappears. Add coriander powder, chilly powder, garam masala and turmeric powder and salt. Saute for a while. Now add tomato paste and saute for 5 minutes. Then add cashew paste and saute for 1 minute. Add milk and mix well until all the ingredients combine well. Add more milk if required. Now remove the paneer from hot water and squeeze them gently. Add paneer to the gravy and bring it to boil. Further, simmer for 2 minutes and switch off the flame. Finally, add the chopped coriander leaves and serve hot with naan, roti, chapathi, lachha paratha or kulcha . Rich, creamy sabji, loved it. 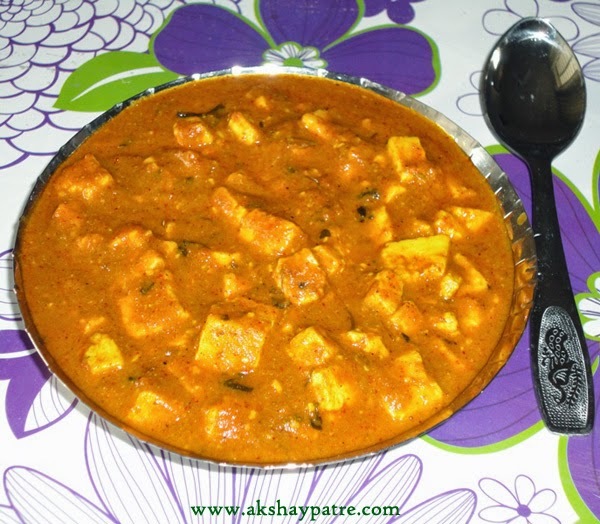 Paneer curry looks creamy and delicious..